How does one go about setting the logo attributes that show up in flight planner? i.e, the background colour/text etc? The logos always set the INV image also? Mucking about with these settings do nothing? Remove the space before the numbers, and set your chosen colour preference (RGB). 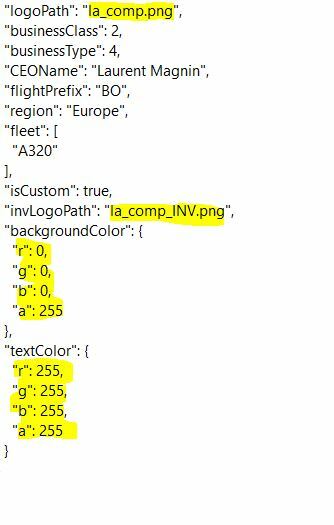 Adjust the (a) alpha number according to how opaque you wish the logo to be, i.e 0 = lightest, and 255 = darkest. Works best if you have your XXX_INV.png pure white on transparent.